Most businesses are aware of the importance of social media marketing, but the number of companies really succeeding at it represent just a drop in the ocean. When you think about it, the world of social media is a lot like the ocean actually – constantly moving and evolving due to trends and feature updates. Those who really want to to succeed at social media marketing are like expert surfers, continuously swimming in the seas of change, riding the waves of trends, finding the best tools to keep their boards working well and keeping a close eye on the horizon for new best practices. Where am I going with this surfing metaphor? 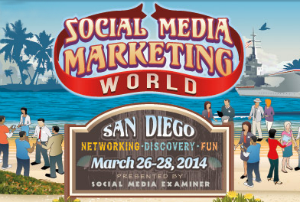 Social Media Marketing World 2014 in San Diego, California of course! That is where several of the team from TopRank Online Marketing will be diving headfirst into the ocean of social media marketing smarts . On March 26-28 some of the best social media surfers will be sharing their tips, tricks and secrets and we can’t wait to dive in. In an industry that changes as fast as online marketing, it’s imperative that marketers stay nimble in their social media strategy. Social marketing best practices are constantly evolving and rarely agreed upon. That’s why it’s so exciting that we get to learn about social media marketing tactics from the best and the brightest at #SMMW14. We’ll ride the edge of social media innovation as we learn about social media ROI, time-saving tools, the intersection of content and social and more. #SMMW14 will give attendees the unique opportunity to interact with some of the world’s best social media strategists both online and in person. The tweets will fly as we attend sessions together and explore the city of San Diego. Engagement will flow and follower / following counts will increase as social media marketers connect and share insights with each other. The benefits of attending this conference will extend far into the future as we continue to interact socially with the marketers that we met at this conference. We’re looking forward to learning from and rubbing shoulders with the marketers who are making social media magic happen for big brands like LinkedIn, Citrix, IBM and Whole Foods. We’ll learn all that we can from influential social marketers at #SMMW14 and then put this new information to work helping our clients expand and improve their social media marketing programs. The TopRank team wants to share the best social media marketing strategies and tactics that we learn at this conference with you! Our CEO Lee Odden will be giving a presentation on How Content Plus an Influencer Network Can Help You Grow Your Business. In addition to myself, Lee and Jesse Pickrain from TopRank will be busy tweeting interesting insights from the keynote speakers as well as live-blogging the highlights of the sessions that we’re attending. Get in on the action by following @toprank, @leeodden, @emilybacheller, and @jpickrain on Twitter! Coming from the freeze of Minnesnowta, we can’t wait to jet off to sunny southern California! We’re usually knee deep in snow by the end of March, so spending a few days in California will give us that first taste of spring that we’ve been waiting for. We also expect to have a lot of fun at Social Media Marketing World, knowing that the organizers do a remarkable job of making this conference exciting and memorable! From nautical networking parties on an aircraft carrier to the sea lions in San Diego Bay, we know that we’re going to have a great time at #SMMW14. BONUS: TopRank Online Marketing is the sole media sponsor for Social Media Marketing World and we’ve created the most awesome of conference eBooks featuring tips, tactics and insights from 38 of the numerous speakers at #SMMW14. From famous social media starts like Mari Smith and Jay Baer to savvy social brands IBM and Whole Foods, this eBook will be an amazing primer for the conference. Be sure to watch for it here on Online Marketing Blog. Will we see you at Social Media Marketing World this year? What are your top reasons for attending? Will you try to surf while you’re in San Diego?